A free society relies on a media that we can trust – which tells the truth, and treats everyone fairly, whatever their religion, ethnic background, gender or sexuality. Yet studies consistently show that the UK press is among the least trusted in Europe. Financial incentives are pushing some newspapers to produce headlines which distort the truth, play on prejudice, and demonise minority groups in our society. This problem matters, above all, because it’s having a real impact on people’s lives. 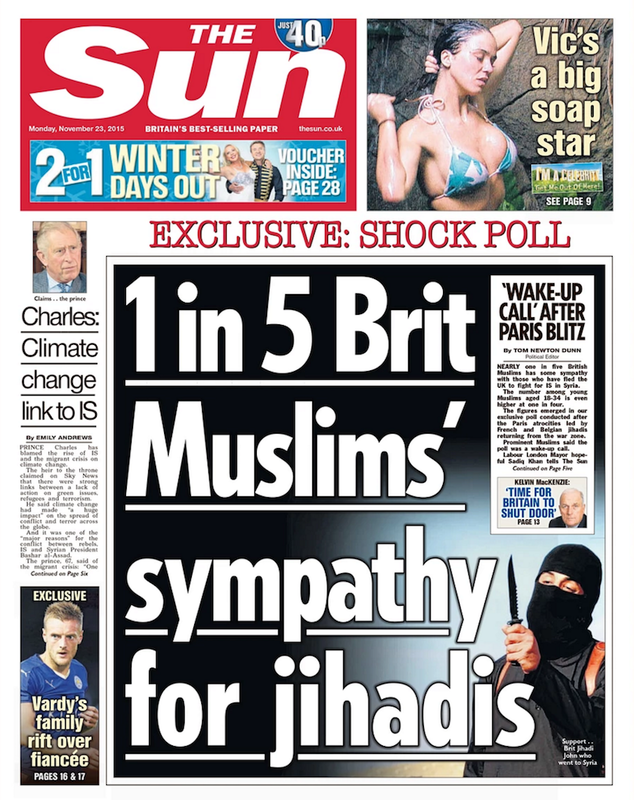 As long ago as 2010, experts were warning that hostile media coverage was fuelling a rise in anti-Muslim hate crime. In 2016, Leicester University’s Centre for Hate Studies warned that a wider surge in hate crime against migrants had been “fuelled and legitimised… by the media”, while Cambridge University highlighted that “Mainstream media reporting about Muslim communities is contributing to an atmosphere of rising hostility towards Muslims in Britain”. Research by the United Nations High Commission for Refugees has found that the Daily Mail – along with The Sun – showed a hostility towards migrants that was “unique” among the newspapers they sampled across five European countries. In 2016 the Sun and Daily Mail were accused of “fuelling prejudice” in a report by the Council of Europe on hate speech and rising racist violence. The report highlighted discriminatory coverage not only towards Muslims and migrants, but also travellers and the LGBT community. The authors warned that: “fuelling prejudice against Muslims shows a reckless disregard, not only for the dignity of the great majority of Muslims in the United Kingdom, but also for their safety”. The problem has been going on for years. But recently it has intensified. As print sales decline, newspapers have been seeking to boost their readership – and thus their advertising revenue – with ever-more extreme coverage. Research by the former Times journalist Liz Gerard has found that anti-migrant stories in the UK press have been steadily increasing year-on-year. In 2016, the Daily Mail and Daily Express ran 1,768 pages with stories about migrants – almost all were negative. Miqdaad Versi of the Muslim Council of Britain has secured a string of corrections after challenging a “consistent stream” of false and misleading anti-Muslim stories in UK newspapers. “History has shown us time and again the dangers of demonizing foreigners and minorities… it is extraordinary and deeply shameful to see these types of tactics being used… simply because racism and xenophobia are so easy to arouse in order to win votes or sell newspapers”. Press standards group Trans Media Watch has warned of an “increase in sensationalist and sometimes misleading articles published by the Daily Mail on the subject of children who question their gender… Given that research shows a high level of suicidal ideation among young trans people, this is dangerous and irresponsible behaviour”. And while the demonisation and distortion may have become normalised within the UK, internationally the behaviour of our press is a source of growing concern. “Elsewhere in Europe… there has been a similar process of demonization taking place, but usually led by extremist political parties or demagogues rather than extremist media”. Our media has a vital role to play in challenging corruption, informing democracy, and holding the powerful to account. But right now this role is being undermined by a business model that no longer serves the public interest. To bring about a better media we have to change the business model. If enough companies switch their advertising away from newspapers that demonise minority groups – and towards those which report accurately and fairly – then this will ultimately make hate unprofitable. The problems in the UK press reflect a worldwide rise in media hate and “fake news”, which has been fuelled by advertising. When the drive to maximise readership is the sole basis on which companies decide where to advertise, media outlets may be motivated to boost their sales – and online “clicks” – by any means they can. Advertising in a moral vacuum can thus create a perverse incentive for outlets to publish hate speech, “fake news” and other content with harmful social consequences. There is a growing recognition of this within the global advertising industry. Randall Rothenberg, the President of the US-based Interactive Advertising Bureau, has argued that “fake news is much more than a supply chain failure. It represents a moral failure, as well – one that implicates marketers, agencies, publishers, platforms, and technology companies alike” . “You wouldn’t want your daughter to ride in a car made with faulty tires. You wouldn’t want your son to breakfast on a cereal sourced from bacteria-riddled grains. Then you shouldn’t abet the creation, distribution, or monetization of untruthful, dangerous falsehoods to other people’s’ sons and daughters”. Find out how you can get involved in Stop Funding Hate.